1) Design conforms to FBC 2014, IBC/IRC 2015/2012 and NDS 2012. 2) 3/16˝ thick Structural steel shall conform to ASTM A36, yield strength 36000 psi and 58000 PSI Tensile Strength. Load Value shown are based on Steel Stress without 33% increase. 3) All welding shall be minimum 3/16˝ with E70 electrodes and shall conform to latest AISC/AWS codes. All contact areas shall be fully fillet welded. 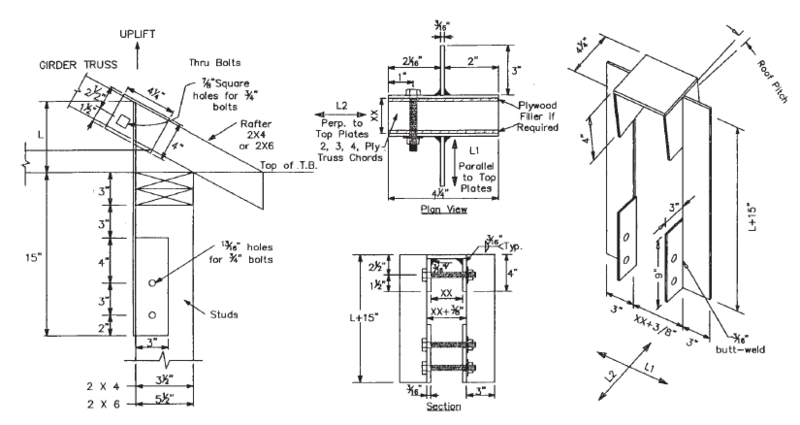 4) All 3/4” diameter bolts through wood shall be per ANSI/ASME Standard B18.2.1. 5) The Lateral loads shall not exceed the Truss Chord Capacity. 7) Uplift and Lateral values shown are reduced for bolt spacing and edge and end distances. Uplift loads shall not exceed Truss chord capacity. 8) Uplift and Lateral values are also controlled by compression perpendicular to grain of 565 psi for Southern Pine per and 625 psi for Douglas Fir per NDS. For other species, contact Engineer for values. 9) Provide plywood shims to close the gap between truss chords to obtain full bearing and prevent bending of thru bolts. 10) All products are painted Royal Blue for easy identification.